Here's all the tips and tricks you need to beat every boss in Splatoon 2, and dominate other Inklings in Turf War. Splatoon 2 is finally here, and you can squad up in style as your favorite Inkling, taking the fight to various bosses like the Octo Shower in the single player, or heading online in Splatoon 2 Multiplayer to splat other Inklings in games of Turf War. No matter what your preference of game mode is in Splatoon 2, we’ve got a Splatoon 2 guide with all the tips and tricks you need right here. In this section of our Splatoon 2 Multiplayer guide, we’ll be going over how Turf War works, as well as how to consistently win Turf War. We’ll also be explaining how you can obtain food booster items through Crusty Sean, that’ll help you on your way to unlocking Ranked matches at level 10. You’ll want to scour some of the single player levels of Splatoon 2, in order to acquire the tickets that give you access to booster items from Crusty Sean in Inkopolis Square. These aren’t easy to acquire, so you’ll have to keep your eyes open, but the food booster items you can get from Crusty Sean can prove invaluable if you’re trying to unlock a specific item. Once you’ve got one of these boosts, simply hop into a few games of Turf War, with the aim of levelling up to level 4. At this level, all the shops in Inkopolis Square open up to you, and you can equip your Inkling with new hats, tees, and shoes, as well as more powerful weapons from Sheldon. 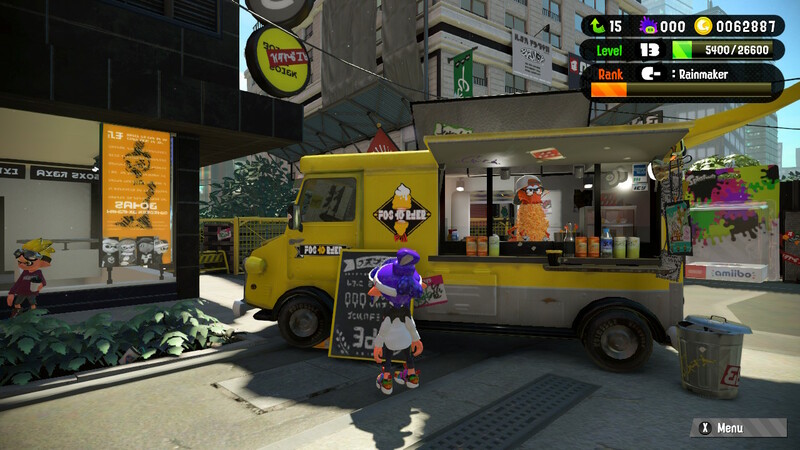 Crusty Sean's food truck in Splatoon 2. Turf War is the only online mode available in Splatoon 2’s casual, unranked online matches. A single match of Turf War doesn’t take long to complete, and is the only way you can level up to rank 10, in order to unlock Splatoon 2 Ranked matches. Turf War features two teams of four Inklings, and lasts for right around 2 minutes. To win the game of Turf War, you need to cover more of the battlefield in your ink than the other team. The key to stopping the other team is eliminating the opposing Inklings, as well as going over their ink with your own. Super Abilities can give you a great edge in Turf War, covering a large area around you in your own ink, or giving you a boost for a short time. In playing online games of Splatoon 2 to reach level 4, you’ll start to get the hang of the weapons and play style that better suits you. For example, if you like to move quickly then the Splat Dualies might work better for you, but if you’re more focussed on covering every inch of the battlefield with ink, then the slower Splat Roller might be better. Don't forget to cover your own spawn zone in ink! This is something a lot of teams forget when playing Turf War, as everyone races to be the first into the middle of the map. While gaining a foothold in the middle of the map is important, you shouldn't forget to ink your own spawn at the beginning of the game, as this can be the decider in a close battle. As soon as you hit level 10 after playing the Turf War mode for a while, you'll unlock the Ranked Battles mode. Ranked Battles feature the Splat Zones,Tower Control, and Rainmaker modes, all of which require far more teamwork than Turf War in order to win. You can find all the info you need to win at either Splat Zones or Tower Control over on our Splatoon 2 Ranked Battles guide page. Remember the game mode! If you’re in Turf War, then it’s better to focus on covering the battlefield with ink, rather than playing it like team deathmatch and going after players. At the start of Turf War, it’s best to split up and head straight into the heart of the map. You don’t want to arrive there and find that the enemy team has already dominated the middle of the battleground with their ink. Whereas it’s best to split up for Turf War, it’s best to stick together for Tower Control in Ranked matches, as you’ll need to work together to take control of the single tower. As soon as you have your Super Ability ready, use it! There’s nothing worse than being killed and having your counter towards it pushed back. Keep moving! Don’t bother covering every inch of the surrounding area in ink, as it’s best to shoot your load over a wide area, and then keep moving to the next section of the map. Find the gear that best suits your playstyle, whether you need a more substantial ink tank, or the ability to move quicker while in your squid form. Remember, the most expensive gear isn’t always the best. Remember to try out new weapons once you’ve unlocked them. Each weapon is suited to a different type of combat, from the close range Splat Dualies to the long range Splat Charger. If you've got an old piece of equipment that you no longer use, consider heading to Murch in Inkopolis Square, where you can pay to have the ability slots in a piece of clothing either increased, or scrubbed out, allowing you to effectively redo them. If you want to unlock more ability slots for your favorite pieces of clothing in Splatoon 2, then you've going to need to get your hands on a Super Sea Snail. While it's only speculated that Super Sea Snails will be rewarded to those who participate in Splatoon 2's Splatfests, the only way to earn then for certain right now is hitting Rank 30 in multiplayer. Once you've eventually hit Rank 30, head to Judd the cat in Inkopolis Square, and he'll reward you with a single Super Sea Snail. Take this to Murch (the one-eyed creature who can be found in the same area), and he'll let you unlock a new ability slot for one of your pieces of clothing. Head back to Judd every other time you level up, and he'll reward you with another Super Sea Snail for your hard work. Elsewhere in Splatoon 2 multiplayer, we have a complete Splatoon 2 maps guide hub, detailing everything you need to know about every single map in the game. We'll reveal all the info you need to know in order to dominate on every map, be it in Turf War, Rainmaker, Splat Zones, or Tower Control. 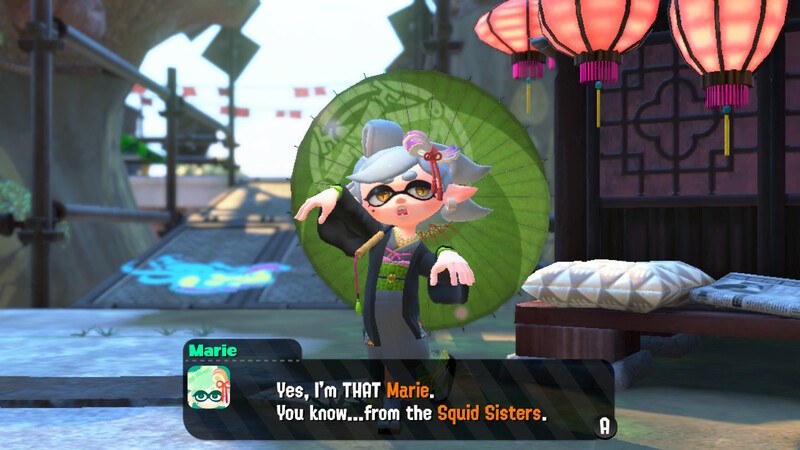 Marie is back in Splatoon 2! 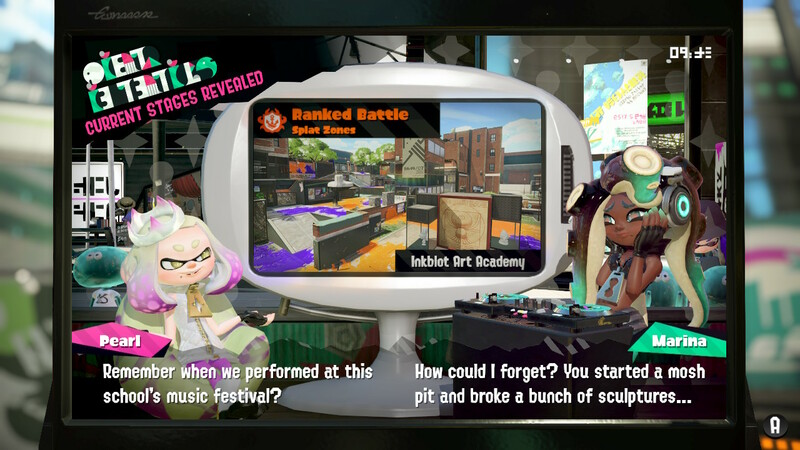 What Are Splatoon 2's Splatfests? Splatoon 2's Splatfests are global events, where players can unite under one of two banners, for example Mayo or Ketchup, and battle it out online to determine which one is superior. For a full explanation of Splatfests, as well as instructions on how to take part, head over to our Splatoon 2 Splatfests guide. We have an entire guide on the best Splatoon 2 weapons, featuring info on how to acquire the best weapons for dominating in Turf War, Tower Control, and Splat Zones. We've got a full guide on beating the Splatoon 2 Salmon Run mode, as well as detailing every boss you can expect to fight throughout the new Horde mode. It's 2017, and that means voice chat should be build into a game, right? Nintendo disagrees, and so you'll have to download the Nintendo Switch Online app through your smartphone, if you want to talk to your friends while playing Splatoon 2. After you've downloaded the Nintendo Switch Online app, log in to the app using your Nintendo ID (or create one, if you don't have it yet), and go into the online lobby within Splatoon 2 on your Nintendo Switch. Go to the 'Online Lounge' option from here, and choose 'Create A Room', then select the type of game you'd like to play, from Turf War to Tower Control. Once you've created your room, select the 'Send Notification to my Smart Device' option, and the room you've created will open up on your phone. Plug in a pair of headphones to your phone, and anyone who joins your room will now be able to talk you to. Simple! Throughout the Splatoon 2 single player Hero Mode campaign, your Inkling will have to make it through a variety of challenge stages, in order to face off against increasingly difficult boss characters like the Octo Samurai and DJ Octavio. We’ll help you through all of these levels, with our Splatoon 2 boss guides and single-player campaign tips. Unless you really want to beat your personal best time for a level, you can take as long as you need to make it through any of Splatoon 2’s single player levels. It’s always worth exploring levels, as you can get vouchers for Krusty Sean’s stand in Inkopolis Square, where you can gain bonuses for Splatoon 2’s online matches. You have a total of three lives for each level, and every time you make it to a checkpoint, you regain a life, in case you already died and lost one. You might be forced to use a specific weapon by Sheldon in some levels on your first time playing, but you can go back and redo any level with any weapon, once you’ve beaten it. Splatoon 2's new figureheads, Pearl and Marina. Below, you can find all our individual guides to beating every single Splatoon 2 boss. The bosses get harder as you progress through the game, so be prepared for a tough fight! Head over to our Splatoon 2 Amiibo Unlockables guide if you want to find out which Splatoon Amiibos you can use with Splatoon 2, in order to unlock bonus items like the Power Armor, Squinja Outfit, and the School Uniform Outfit. While you don't have to buy any of the Splatoon 2 Amiibo to unlock some of the very best weapons and equipment in the game, bear in mind that the items listed in the guide above can only be unlocked through the use of both original Splatoon 2 and Splatoon 2 Amiibo. Splatoon 2 New Weapons, Maps and Playable Octolings Coming Soon? Over on Reddit recently, a user posted an extensive datamine of Splatoon 2's files, which revealed several interesting details. Two new maps are slated to be in development for the game, named Line and Tunnel, as well as new weapon named the Squeezer, which uses semi automatic fire to take down enemies at long range. But the biggest reveal is in the form of the 'PlayerType' values, which include SquidGirl, SquidBoy, and Oct. Elsewhere, 'OctoBoy' is also mentioned in the files - does this mean we could be playing as an Octoling for the first time in the Splatoon series? What we do know for certain is that there will be a new map for Turf War called Manta Maria, a new Salmon Run stage called Lost Outpost, and a new weapon called the Bubble Blower, all of which you can see in the trailer just below. That’s all the tips and tricks you need to get dominating in any level of online match of Splatoon 2, and using all this advice you’ll be unlocking Ranked matches and beating your personal time for levels in no time at all. Retro is looking for a Lead Art Director and Character Designer, among other positions.